Art is manifest in many forms. Fashion and costume designers are unique artists whose creative process starts on paper—or on a computer screen—and eventually morphs into a three dimensional collage of fabrics, textures, color, and motion, often with a splash of drama, humor, or whimsy. Artists' individual styles reveal what inspires their imagination and creativity. The original artwork presented here reflects the high level of skill and talent of artists, many of whom are legendary in the fields of fashion and costume design. 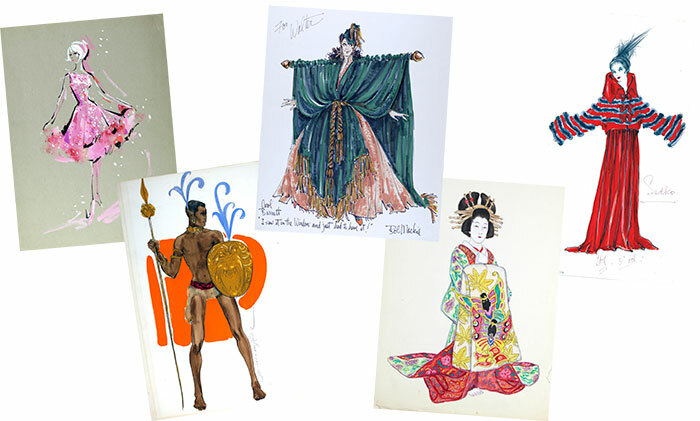 Shown are artworks found in UCLA Library Special Collections in the archives of designers Bonnie Cashin, Giorgio di Sant'Angelo, Lucile Lady Duff Gordon, Dorothy Jeakins, Robert Kalloch, Bob Mackie, and others. The exhibit was organized by Library Special Collections staff members Julie Graham, Accessioning Archivist, and Octavio Olvera, Visual Arts Specialist. Special thanks to colleagues Caroline Cubé, Genie Guerard, and Russell Johnson for providing invaluable technical support.